It’s not often that a label also manages to be a musical movement, but Two Tone confounded the stereotypes to be exactly that. Rising out of punk and reggae, the bands on the label – and largely who controlled the label – were racially mixed, still a rarity in Britain in the late 1970s. The fact that the speeded up ska sound, which was Two Tone’s trademark, would be so successful was beyond anyone’s expectations, but it struck a chord with the British public (and overseas, too). Two Tone used the DIY ethic for the label, keeping control of the product and for a while was as successful as any major. 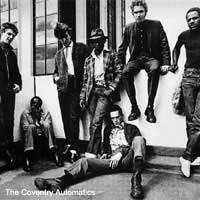 It all began with a punk band, The Coventry Automatics, based in the Midlands. Their multi-racial blend of punk and reggae wasn’t working as they’d hoped, so instead they began playing ska, speeding it up for the young crowds with punk tastes. Changing their name to The Special A.K.A., they toured with The Clash – even though they’d yet to release a record. Determined to go their own way, rather than sign with an established label, they borrowed money to record one song, and took another from a home recording by a friend to fill the other side. They pressed up copies and named the label 2 Tone, with its distinctive black and white logo. To their surprise, that single, Gangsters did well, and once they’d organised distribution, it became a national hit. That was followed by singles from Madness and the Selecter, both ska records, and both big hits. The Two Tone craze was underway. Renamed as just The Specials, they scored a hit once again with A Message to You Rudy, after which they put out the debut by another Midlands ska group, The Beat. Everything the label issued made the top twenty, and most went higher. Suddenly Britain loved the new ska. The problem was that it all became too big too quickly, leaving the artists divided between business and music, with both suffering, especially The Specials, who were at the centre of it all. Inevitably there was dissension in the ranks and The Selecter left for greener pastures, but The Specials soldiered on until 1981, breaking up after their biggest-ever single, Ghost Town, a song that perfectly echoed the mood in England during a period of riots. Two Tone continued after the demise of The Specials, bringing out more singles from artists like Rhoda Dakar and trombonist Rico Rodriguez. Jerry Dammers, leader of The Specials, effectively became Special A.K.A. again and spent two years working on a studio album, although his biggest triumph was 1983’s single Nelson Mandela, which gave Two Tone its last chart hit, selling over 150,000 copies. The label limped along, putting out its last record in 1985, although many of the songs live on in frequent reissues. So what made Two Tone so important? The fast beat ska proved a template for bands worldwide (in America it’s still referred to as the “second wave” of ska, and remains influential on many young bands), with its energy and the sheer joy of its performances. Many of the bands managed to mix political lyrics with a highly danceable beat and catchy melodies – prime examples of political pop music. Strong pillars in the Rock Against Racism movement that was prevalent at the time, the Two Tone bands, with their multi-ethnic makeup of black and white artists showed that integration could work in 20th century Britain. It also showed that artists could be successful as independents, with their own label, running their own lives. Granted, it only lasted six years, but the number of hits they racked up during that time showed they caught the mood of at least part of the nation, and did it themselves.